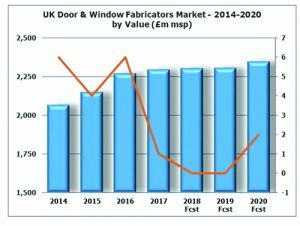 The UK door and window fabricators market put in a strong performance between 2013 and 2016 but appears to have flattened out in 2017, reveals ‘The Door and Window Fabricators Market Report – UK 2018-2022’ from AMA Research. The key defining factors that continue to pervade the market include; market maturity, fragmentation, competition, cost-management, building legislation, ‘green’ building, tough market conditions and diversification. Competition between suppliers remains intensive particularly given the current challenging economic environment. Growth prospects therefore remain modest with only marginal growth at best forecast in the short term. The UK door and window fabricators market is driven by many factors, reflecting exposure to a number of markets, at times moving in different directions. These include private home improvement, public sector housing renovation, new housebuilding, commercial new-build and refurbishment. Many door and window fabricators have responded to consumer market demand by broadening their range with alternative materials, styles and technical improvements to capture preferences which have included greater thermal and security features as well as triple glazing and increased colour options. The commercial glazing market has experienced steady demand in recent years with office construction in particular a key driver of growth. However, continued over-capacity in the industry, especially in the PVC-U sector, is resulting in intense competition for business mainly amongst the larger retail suppliers. The market for residential windows is largely driven by demand in the replacement sector. Value growth 2015-17 for residential windows was good as manufacturer, distributor and materials price increases were applied. Residential new work is forecast to provide opportunities within the window and door market but with RMI and residential replacement programmes likely to be somewhat depressed by lower consumer confidence levels and spending. The non-residential sector is facing additional challenges and is likely to see subdued growth in the commercial glazing sector, and decline in other sectors such as ground floor treatments. Medium-term prospects for the commercial windows sector will be determined by the return of confidence in the private commercial construction sectors, particularly for offices. Ultimately, the industry is mature and, in the longer term, heavily dependent on replacement demand in the residential sector, a market which into the medium term will be influenced by aspects such as security, aesthetics, improved thermal performance/energy efficiency and product failure, which will remain the key reasons for replacing windows and doors. For more info call 01242 235724.